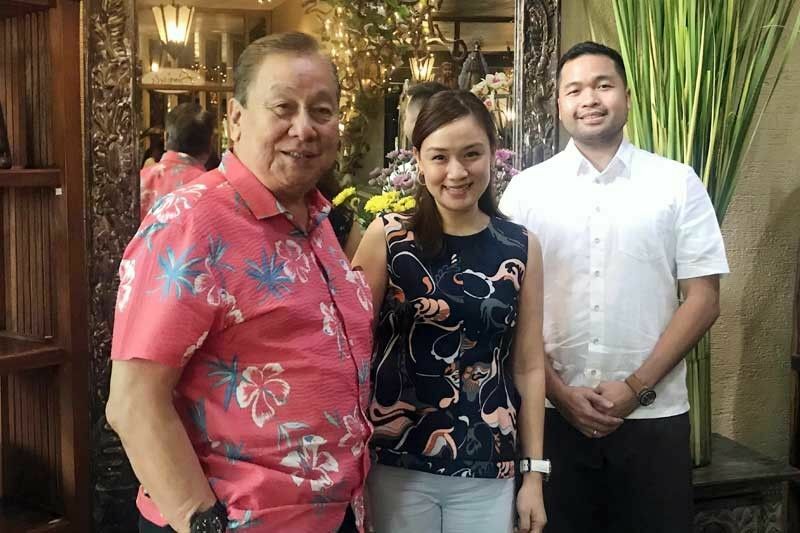 Since she comes from a family steeped in politics, it is presumed that Lei “Chi” Atienza-Valdepeñas is also interested in running for a government position. Chi was referring to her father, former Manila Mayor Lito Atienza who’s the Buhay Party-list bet in the May mid-term elections, her sister Maile (for councilor in Manila’s Third District), her brother Ali (for congressman in Manila’s Fifth District) and her husband Von Valdepeñas (former councilor of Los Baños, Laguna). In fact, Chi is following in the footsteps of her dad, not to politics but to television. 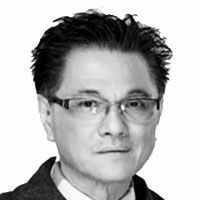 Since as per COMELEC guideline TV hosts/stars running in the mid-term elections are “banned” from appearing on television and in movies, Chi has replaced Rep. Lito as host of the 20-year-old feel-good show Maynila (airing Saturdays on GMA at 9:45 to 10:45 a.m.) effective Saturday (March 16) last week. The job is right along Chi’s alley. In case you haven’t heard, Chi was a member of ABS-CBN’s Star Circle starting when she was 15 and, together with her co-Star Circlers (among them Heart Evangelista), was trained on hosting, singing and dancing, and acting. Like her Kuya Kim (an accomplished TV host), Chi is gracious, gregarious, a good speaker and a go-getter who is at ease with all kinds of people. Very easy to love and like, thus perfect as TV host. “But I’m good only until after the elections,” added Chi who is full-time wife to Von and mom to their three children. “She should go on,” insisted Rep. Lito. “She can have the show all to herself.” That is, if not continuing as her dad’s co-host. A blocktimer, Maynila has been serving as launching pad for newcomers. Among the now-popular stars who have appeared on the show when they were just starting in the business were Kristine Hermosa, Dingdong Dantes and his wife Marian Rivera, Jennylyn Mercado, Pauleen Luna and others. The show has nurtured such a following that it’s popular not only nationwide (“People in far-flung areas would sing the show’s theme song when they see me,” said Rep. Lito) but also abroad (in Dubai, Maynila ranks among the most-watched Filipino shows among OFWs). Rep. Lito is famous for his floral shirts, so somebody suggested that Chi should also have her own ”signature” attire. Incidentally, present during the interview with Rep. Lito and Chi was Von, president of Rotary Aseana, director of Buhay Party-list and owner of V1 Corp, a company that operates industries like real estate, transportation, construction and trading. He has just been inducted as president of Goodwill Philippines which champions the cause of PWDs. “I am humbled and honored to be chosen to take such an important responsibility,” said Von, doing so with no salary nor deriving any benefit from the organization. 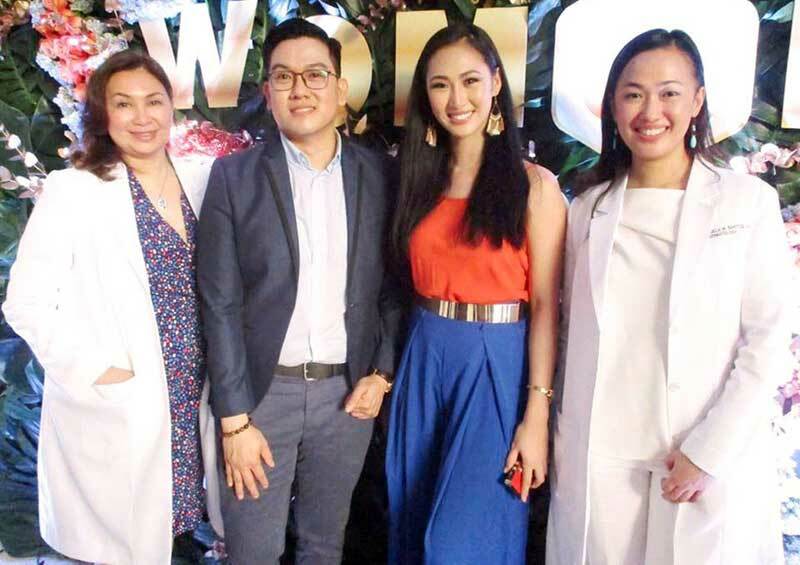 Miss Globe International Asia 2014, model, host Princess Ramos (third from left) is the face of Avignon Laser Dermatology, an alternative clinic to skin and aesthetics concerns. With Princess are (from left) medical director Dr. Ma. Angela Tomacruz-Cumaguin, general manager Benedict Sy and board certified consulting dermatologist Dr. Angela Santos.